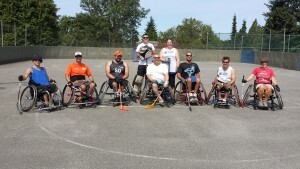 Canada’s Wheelchair Floorball team post practice. The firm is proud to help sponsor Team Canada’s – Wheelchair Floorball team that will be competing at the ParaGames in Breda, Netherlands from September 17-20, 2015. GO CANADA GO! Wheelchair floorball is an adapted version floor hockey, played with concave weaved plastic blade sticks and a plastic wiffle ball. Two years ago Canada put a team together to travel to Holland to compete in the 2013 ParaGames. Canada played against teams from Sweden, Czech Republic, Switzerland, Germany, Belgium, and Holland. We ended up in fourth place losing to Holland in the Bronze medal match. This year’s Captain and Team Manager Kyle Gieni also happens to be a Resource Coordinator at the Personal Injury Resource Centre and he says he’s delighted to be a part of this opportunity. Kyle points out that as the lone country from the Western Hemisphere, Team Canada will be on the radar of the European teams but he’s confident of Team Canada’s ability to challenge for a spot on the podium. Good luck Kyle, bring home the gold…where it belongs.